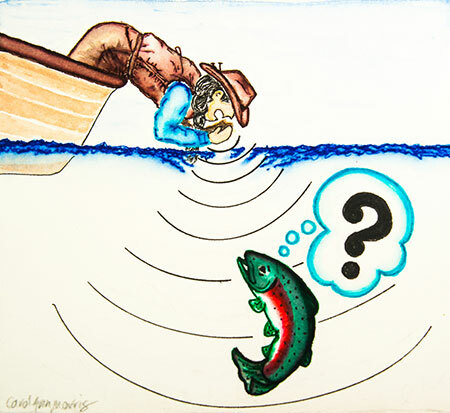 Answer: The standard question about fish and sound goes something like this: Do fish hear sound? The standard reply goes about like this: Fish are very sensitive to sounds made in or on water but not to sounds made in the air. It’s a solid, useful answer. But your question, though plainly related to it, Wayne, isn’t the standard one. It’s interesting, though. . .
See? Told you he was a fisheries biologist. This brings up a question for you to answer, Wayne: Do you ever lower your face almost to a lake or river and then yell at it? No? Good—that’s an indication of sanity. Sanity, at least to the point of not screaming at inanimate substances or objects (other than computers and old cars), is a fine quality in a fly fisher. Though, some would argue, rare. You asked a question that made me pause and consider, Wayne, and I hope that, with Brian’s help, I provided you a satisfying answer. Still, at the end of it all, this fact remains: it’s the sounds you make on or in water that really matter in fishing.